I looked for smart charger chat can charge 9V NiMH battery in couple of hours and didn't found one. Moreover all chargers I found was really "dumb". Charging current unknown and no function to terminate charging after battery fully charged. Problem with such chargers that they can overcharge battery and significantly reduce lifespan. So I decided to create "smart" charger. First version I intend to keep simple, so it allows basic things like charging with constant current, automatic charging termination after battery fully charged, trickle charge, measurement of charge transferred to battery. In next version I will add couple of additional useful features like discharge, capacity measurement and cycling. Warning: Charging battery with high current may cause battery explosion or fire. Please don't leave charger unattended. Also please don't try to charge battery don't intended to be charged as Alkaline. This charger tested only with NiMH batteries (and still you are using it at your own risk and I am absolutely have no any responsibility if any damage caused because of bugs in design or code). Chagrin of other types of batteries will require code modification. Some useful facts to remember that will help to understand needed parameters of charger. When charged at the C rate single cell voltage may reach 1.6V. This voltage may be higher for old batteries. Nominal voltage of single cell is 1.2V, but fully charged cell has an open-circuit voltage up to 1.5 volt. Trickle charge rate of less than 0.025 C (C/40) is recommended after battery fully charged. 2. Slow charging. Charging current 0.1C. Charging time 14-16 hours. Charge termination by timer. dT/dt charge termination impossible for low currents. dV/dt termination may be not reliable for currents below 0.5C according to literature. 9V battery usually has 7 serially connected sells, but in some cases it may have 6 or 8 cell. Voltage regulator should be able to provide charging voltage at least up to 8*1.6=12.8V. Dropout voltage of LM317 regulator up to 2V, so supply voltage need to be ~15V (this not taking to account voltage drop on current sensing resistor). For maximum charging current of 200mA and current sensing resistor 10 Ohm additional drop on current sensing resistor is 2V, so 17V supply voltage needed. Fully discharged cell may have very low, even negative voltage. 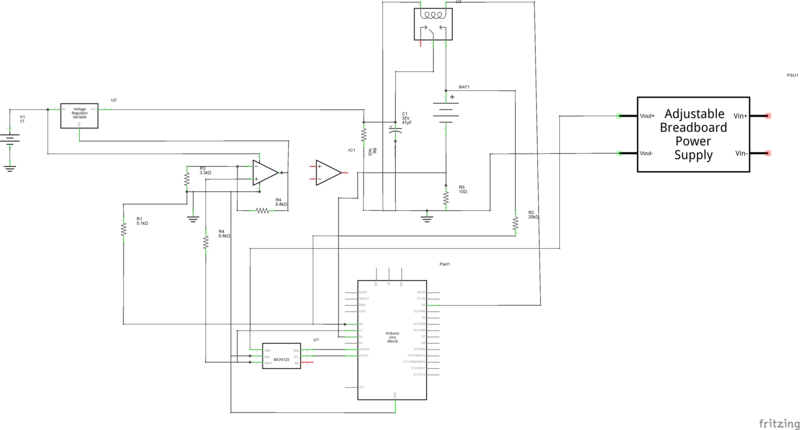 Minimum voltage of regulator ideally should be 0, but using LM317 it may be as low as 1.2V. The basic idea is to measure charging current and adjust voltage of regulator until desired current reached. Current measured by measuring voltage drop on current sensing resistor R5. I=V/R. SparkFun I2C DAC Breakout - MCP4725 - 12 bit digital to analog converter used to control voltage. Output voltage cam be configured via I2C between 0 and 5V. Because we need to be able to adjust voltage in wider range, from 0 to 15V operational amplifier LM358 used to amplify output voltage of DAC. Amplification of operational amplifier set by resistors R4 and R3. Gain=1+R4/R3=1+6800/3300=3.06 so output voltage of operational amplifier approximately 0 to 15V. Maximum output current of LM358 is 50mA, so LM317 adjustable voltage regulator used to control higher current. Output of operational amplifier connected to ADJ terminal of LM317. LM317 will maintain 1.2V between ADJ and OUT terminals, so actual voltage on battery can be configured between 1.2 and 16.2V. LM317 need minimum 3.5mA current to maintain regulation. So 1kOhm resistor R6 used to ensure regulation if battery not connected. Capacitor C1 used to filter output voltage and improve stability of LM317. Voltage measured at two different points. 2. Voltage on battery can be up to 16.2V, so resistive divider R1,R2 used to bring voltage below 5V, allowed by Arduino. Output of divider connected to pin A0 of Arduino. For R1=5.1k Ohm and R2=20kOhm Vout=Vin/(20000+5100)*5100=0.2 So battery voltage divided by 5. Relay used to disconnect battery from charging circuit. You can see on photo relay I used, but generally any relay with 5V control can be used. It is more safe to connected battery to normally open contacts of relay. To power Digital to analog converter and LCD I used SparkFun Breadboard Power Supply 5V/3.3V. It is probably will be ok to use 5V from Arduino board. Generally charging current can be up to nominal capacity. For battery with nominal capacity of 170mAh maximum charging current is 170mA. Minimum charging current usually C/10 - 17mA for 170mAh battery. After power is up charger will check if battery connected. If battery connected battery will be charged with configured constant current until fully charged. Charging terminated by detecting negative dV/dt during 5 minutes. After charging completed charger will switch to trickle charging with current C/40. Charger will disconnect itself from battery after maximum trickle charging time elapsed. voltage_readings[averaging_index]=analogRead(BATTERY_VOLTAGE_PIN); //100 us time to read? current_sensing_resistor_readings[averaging_index]=analogRead(CURRENT_SENSING_SESISTOR_PIN); //100 us time to read?